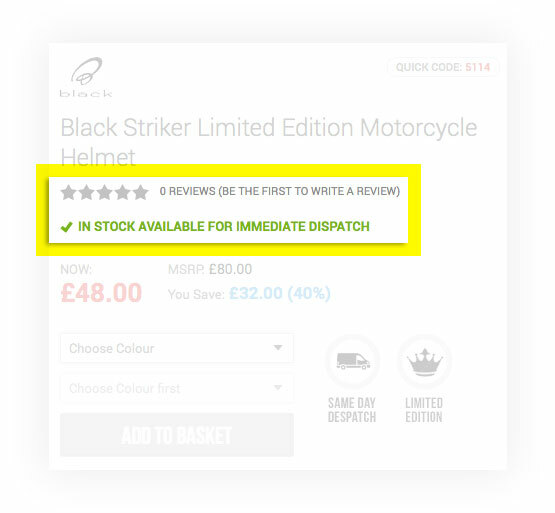 To check if your product is in stock at our store, on the product page, under the title, you will see a product stock status. Please?click here to quickly search for products currently available in our shop. These statuses will let you know whether we have the item in stock at our main distribution warehouse and our shop. It will also indicate if the item/s are ready to collect straight away or whether it is at another warehouse and are subject to a slight delay. This item is in stock at our main distribution warehouse and at our shop, it will be dispatched to you the same working day (if ordered before our cut off times) and can also be picked up from our shop. (If you are travelling far to visit us then please call us and we can look to reserve the stock for you, as we sell on multiple channels and stock may be sold before you arrive. For additional information on other product status's please see our product page in-stock status information here.